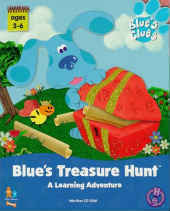 This was the first Blue's Clues CD-ROM game from Humongous Entertainment, which features the USA Blue's characters including video footage of the human character Steve. This two CD game allows multiple pre-school kids to each have their own settings, by entering names. The game is controlled by the mouse, with plenty of things to click on. The images are a collection of real-world, clay, and paper - just like the Blue's Clues tv show. And, of course, there are paw prints to find. In this game, you help Blue and Steve enter the Land of Great Discovery. To do so, you must complete three unique treasure hunts (these can change each time), multi-level pre-school learning, a Blue skidoo and lots of locations.